Yes we specialize in Memory Lamps but we could not resist bringing you this wonderful, warm, thoughtful new gift idea. 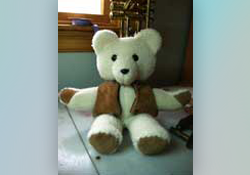 Bears of Love and Memories are the handmade creation of a woman living right here in Massachusetts. Our Memory Bears are entirely handmade and come in 3 sizes: small, medium or large. The bears are all special order to your specifications. The idea is to use for instance your grandmother’s mink stoll that has been sitting in the closet or in the hope chest for many years. Here is an example of a woman who had a bear made out of her mother’s mink stoll for her daughter so she could have a warm comfortable companion and reminder that it is made out of her grandmother's mink stoll. 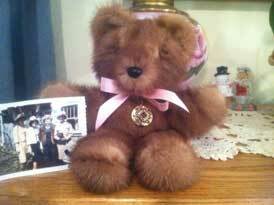 Notice there is a picture sitting beside the bear of the grandmother wearing the mink stoll. What a wonderful gift for any member of the family. 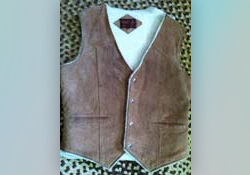 Another bear made from a father's suede and shearling vest. 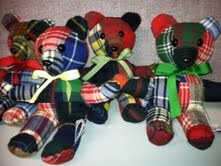 A new group of lovely Memory Bears - These bears are made from a father's pair of pants he wore every Christmas. The anniversary of his passing is coming. One of the daughters had these bears made for her siblings. So very thoughtful of her. They all now can hug what once were just a pair of pants but now are a memory they can literally hold of their dad. My friend has been making these bears for quite some time now and has given me the wonderful opportunity to bring them to you, the public. The examples I am showing you are some that have been completed as bereavement gifts. Below left, is a gift for a son who lost his dad. His dad had two favorite shirts, his Red Sox baseball sweat shirt and denim shirt. He wore them all the time. Well, here it is...a cuddly gift the boy can cherish as a reminder of his dad. 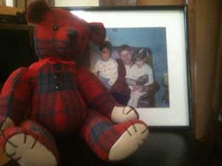 The photo below on the right is another dad that loved his red wool plaid shirt and the mom had a Memory Bear made for the children. These cuddly lovable Memory Bears are truly a comfort to children and people of all ages and gender. Who does not love a bear?! And here is another made out of a bathrobe. As you can see, you can use any material and any piece of clothing for these beautiful, lovable Memory Bears. 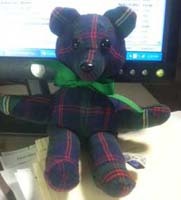 Bereavement is not the only reason a Memory Bear is a great gift. Think of how difficult it is when families move and children leave behind best friends afraid they will never see each other again. Well, a Memory Bear made from a friend’s piece of clothing is a wonderful comfort and can make that transition a bit easier. Or those many bridesmaids’ dresses you have in your closet you will never wear again. What a wonderful anniversary gift for the friend’s wedding you attended as a bridesmaid. Have the dress made into a Memory Bear. A gift she will have for a lifetime and will always be reminded of that very special day in her life. As we are bringing you these great Memory Bears, we would appreciate it if you would contact us by phone: (978-232-9669) or by email: customerservice@memorylampsofbeverly.com and we can assist with the process of how to send us your piece of clothing, how long it will take, and the cost of your bear. We hope you like our Memory Bears. We truly think they are a very special, warm and comforting gift.